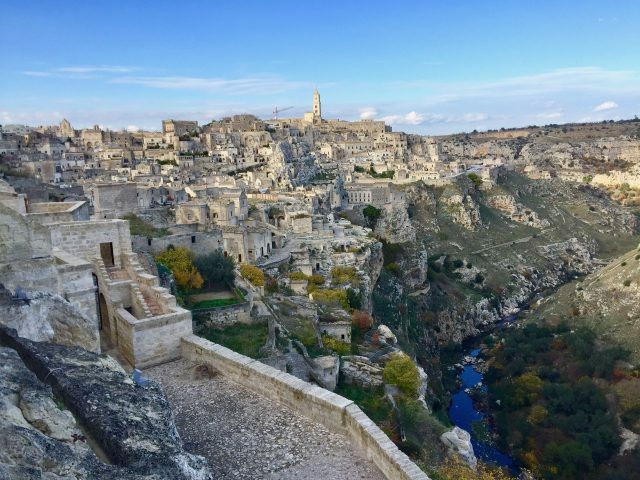 Things to do in Matera - Italy's extraordinary cave city! I walked up the cobble-stoned road towards the Cathedral square. Ahead of me, I could see the towering Cathedral, cloaked in the warm, pinkish glow of the setting sun. Several people stood at the edge of the road, staring ahead in silence. Curious, I stopped to look at what they were staring at. As soon as my mind could register what I was seeing, I gasped. My audible reaction was met with smiles by the others standing there. 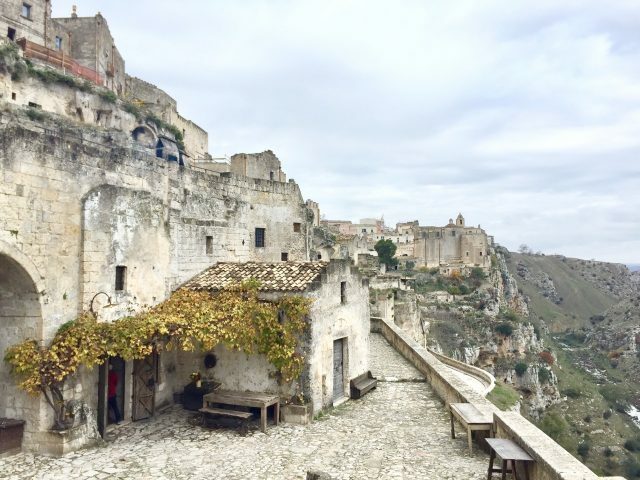 In front of me was one of the most extraordinary towns I’ve ever laid my eyes on: Matera. This ancient city in the south of Italy just blew my mind! 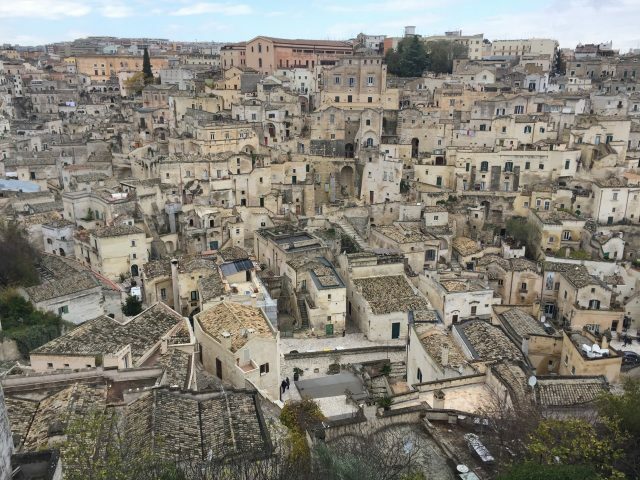 Italy excels in extraordinary cities and towns – and I’ve visited many of them – but Matera surely belongs in the upper echelons of the ‘most extraordinary cities’ list. Located in the region of Basilicata (map), wedged between the ‘heel’ and the ‘foot’ of southern Italy, Matera is also one of the oldest continuously-inhabited human settlements in the world, with a history that goes back (perhaps) 7,000 years! The cityscape is somewhat ‘Biblical’ and strolling around its cobblestone streets is like taking a step back in time. Despite its age, or maybe because of it, there are many things to do and see in Matera, making any visit a wondrous experience. A typical alley in Matera’s Sassi. 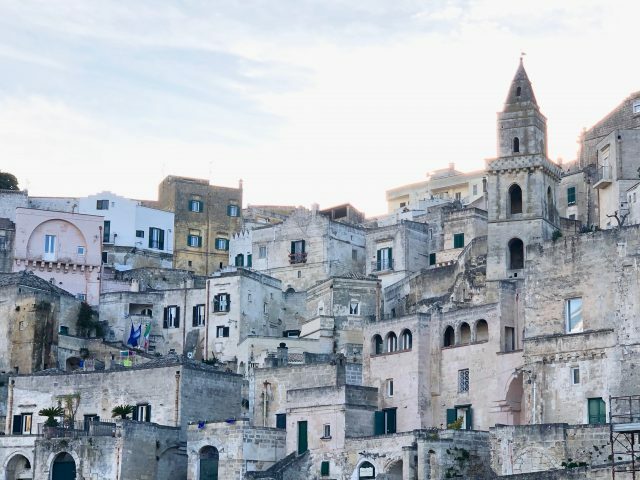 The most-visited section of the city is the Sassi (literally, “the stones”), the historic neighbourhoods that are composed of cave dwellings hewn from the rocky slopes of the La Gravina ravine. Inhabitants lived in these dwellings in abject poverty – the grottoes had no electricity, running water and ventilation, and families of up to twelve shared the cramped space with their livestock. In the 1960’s, the Italian government moved the inhabitants to a modern part of the city, and through the years, began to redevelop the Sassi as a tourist destination. The cave dwellings were renovated (this regeneration continues) to house hotels, restaurants, cafés, boutiques and galleries, whilst historic monuments such as the Duomo (Cathedral) and other ancient churches were lovingly restored. 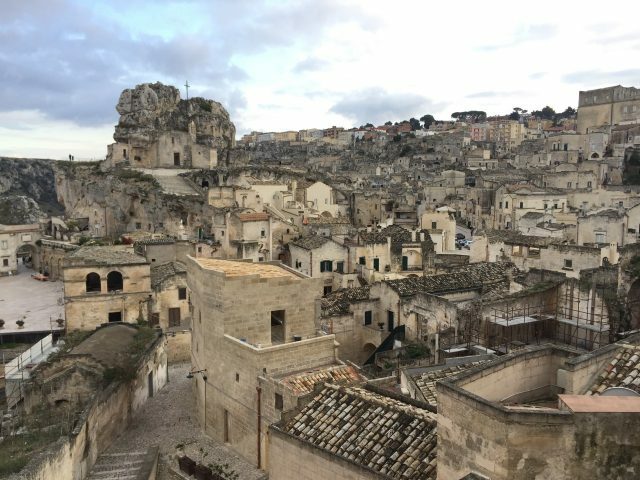 Despite the regeneration, Matera has not lost its ancient, ‘Biblical’ character – in fact, it remains one of the top sites used for Biblical scenes for TV and movie productions. I experienced this first-hand when I nearly tripped over ‘Jesus Christ’ on the steps as I exited my hotel one morning! I looked around and found myself in the middle of a film set! Haha! A view of Matera from Sasso Barisano. The Cathedral tower stands proudly atop the hill. My good friend, Silvia, who hails from Matera, advised me to simply wander and get lost in the maze of ancient streets in the Sassi! There are signposted walking routes which visitors can follow (grab a city map at the tourist office or at the hotel reception) so I did a bit of both, loosely following the routes around Sassi di Matera, Sasso Barisano and Sasso Caveoso, and wandering off ever so often. Silvia was right; this is the best thing to do in Matera! 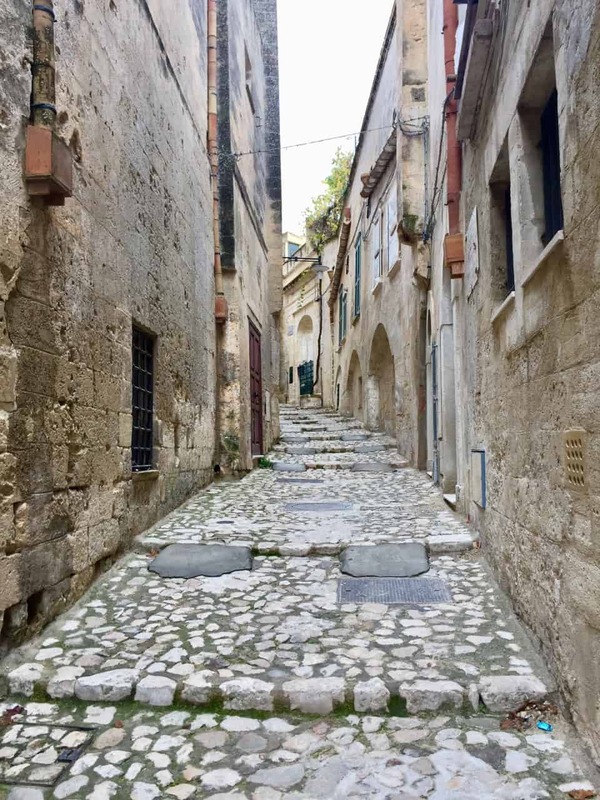 Wander the maze of alleys in the Sassi! 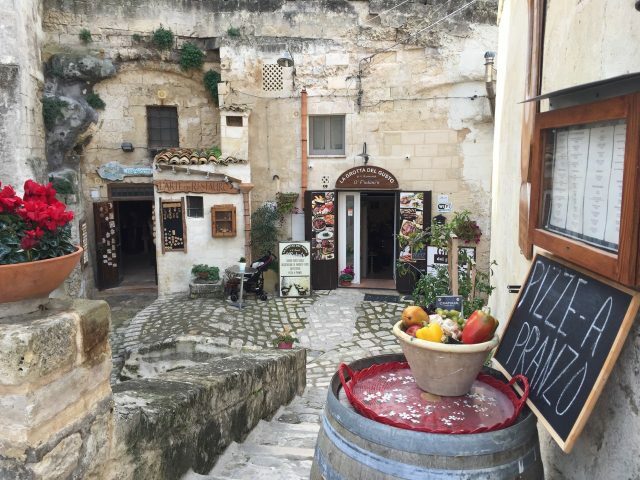 As you stroll around the Sassi, you’ll discover many hidden nooks and corners, and panoramic viewpoints. And catch incredible views like these! Piazza Giovanni Pascoli. This building houses the Museum of Medieval Art. Piazza Vittorio Veneto in the centre of Matera. The ornate San Francesco di Assisi church. Note that there are lots of steps in the Sassi – some parts are easier to navigate than others. The Via Duomo – Via delle Beccheri – Piazza Vittorio Veneto – Via San Biagio line is the easiest (i.e. flattest) route to walk. From this line, staircases and alleys fan out to different parts of the Sassi. You can opt for a walking tour of the Sassi but if you have a physical difficulty, you can opt for a buggy tour of the Sassi. Some steps are easier to navigate than others. The 13th century Duomo (Cathedral), with its beautiful frescoes and crypts, is a must-visit. The platform at the edge of the Cathedral square also offers some of the most breathtaking views of the Sassi, especially at sunset. The view of Matera from the Cathedral square at sunset. Chiesa San Pietro Barisano – this 12th century church houses an ancient honeycomb of niches and frescoes. Chiesa di Madonna della Virtú and above it, Chiesa di San Nicola del Greci – a 10th century monastic complex carved out from the limestone rock with many frescoes. Chiesa di Santa Maria di Idris – built inside the huge Idris rock. The Chiesa di Santa Maria di Idris carved out of the Idris Rock (top left). Ancient frescoes in the cave churches. There are various cave dwellings which have been turned into little museums where you can see what it was like to live in the Sassi up to the 20th century. I visited the Casa Grotta di Vico Solitario (at the foot of the Idris rock) and found it a humbling experience. The underground cisterns of Palombaro Lungo are an incredible sight. Located at the main city square, Piazza Vittorio Veneto, the cisterns were carved out of the rock, forming a massive underground ‘cathedral’ with impressive arches and columns. There are regular guided tours (also in English) every day. The Museo della Scultura Contemporanea (Museum of Contemporary Sculptures) is home to a stunning collection of sculptures. The exhibition space, in a series of houses and caves (some decorated with frescoes), is just as extraordinary as the art! A rigorous hike through the La Gravina ravine (on the slopes opposite the Sassi) takes you past the paleolithic caves which were used as houses, churches and burial chambers. There are various paths to follow such as the Rock Churches Park or the Ancient Path to Montescaglioso. You can also hike to the Belvedere where you’ll have a breathtaking panoramic view of Matera’s Sassi on the other side of the ravine. This spot is also where the crucifixion scenes in the movie “The Passion of the Christ” were filmed. You can also drive to the Belvedere: take the A7 road to Taranto/Laterza and turn off at the signs for ‘chiese rupestri’. 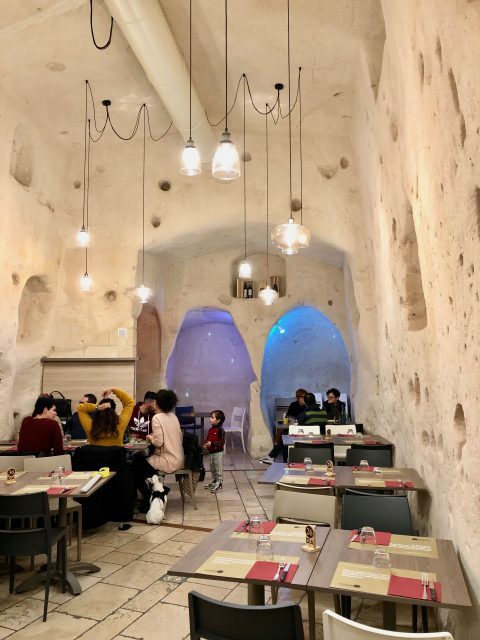 There are many restaurants and bars located inside the former cave dwellings. For a cave dining experience (with excellent food! ), head to Ristorante Francesca, Osteria Pico or Restaurant Soul Kitchen. If you enjoy pizzas, check out Da Zero! And if you’re looking for a fine-dining experience in a cave restaurant, book a table at Vitantonio Lombardo (next door to Da Zero). For a simple meal and drinks, check out Vicolo Cieco, a cool cave bar/café with a retro ambiance. Cave restaurants along Via Bruno Buozzi. Da Zero, a typical cave restaurant, serves some of the most delicious pizzas I’ve ever had! Sublime pizzas at Da Zero! Other restaurants I can recommend include Al Falco Grillaio di Raffaele Paolo, Baccanti and Le Botteghe. For a local snack, drop by at Bar Sottozero for a panzerotto (small, half-moon folded dough filled with tomato sauce/mozzarella). For a glass of (local) wine and cheese or aperitivo, I recommend L’Antica Credenza (wine store/bar) opposite the San Francesco di Assisi church. L’Antica Credenza – a tiny wine store/bar at the Piazza San Francesco. Delicious local cuisine at Al Falco Grillaio di Raffaele Paolo. 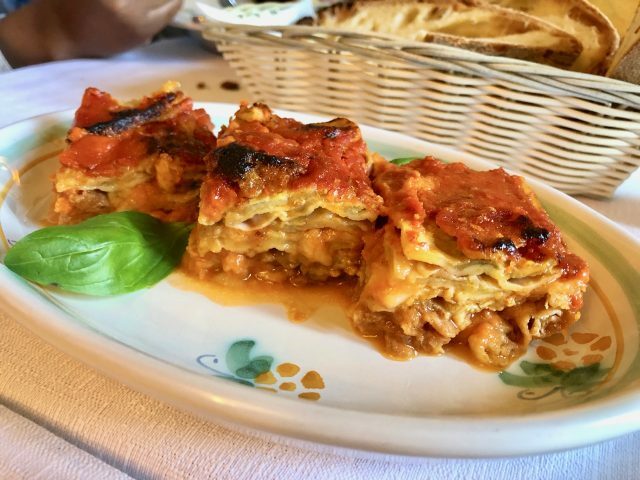 If you’re looking for some fine-dining indulgence, I highly recommend booking a table at Dimora Ulmo ristorante, one of the best restaurants in Matera. The food features many local specialties and is simply exquisite! An exquisite dining experience at Dimora Ulmo. 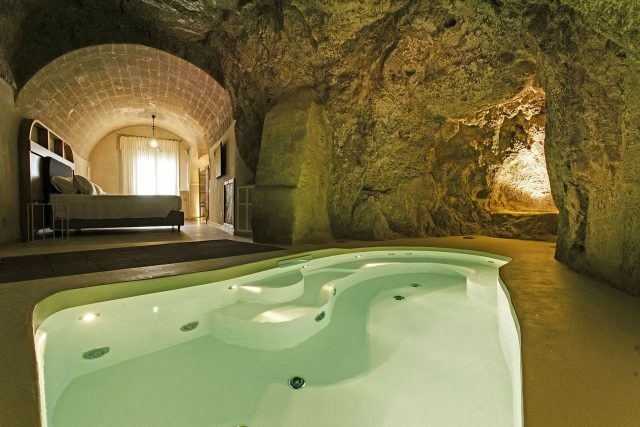 Probably the ultimate Matera experience is to book a stay in one of the cave hotels or B&Bs. The higher end hotels feature luxurious furnishings and chandeliers in the caves. I stayed at the Palazzo del Duca (near the Cathedral) which even had plunge pools/jacuzzis in their cave suites! Another hotel I checked out which looked amazing was Locanda di San Martino. I had an amazing time in Matera – its ancient cityscape, unique atmosphere and historic monuments just blew me away. Matera is the European Capital of Culture in 2019 so lots of activities are planned. My advice is to go there as soon as you can before the rest of the world discovers this gem in southern Italy! 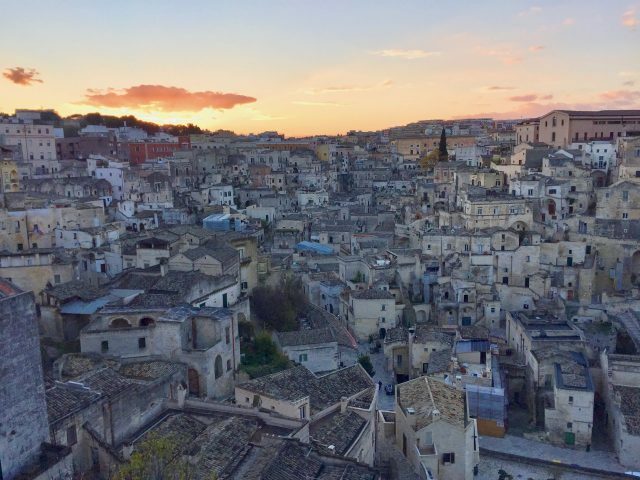 There are lots of things to do in Matera so I recommend spending at least a few days to experience the incredible sights and enchanting evenings. 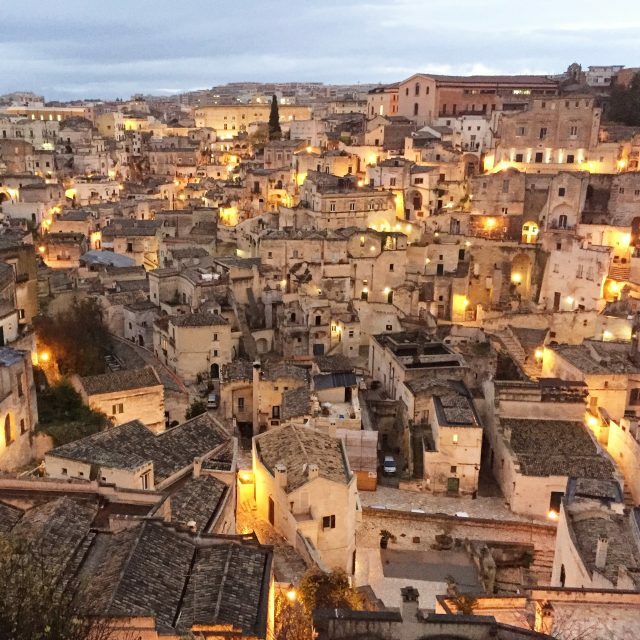 Evenings in Matera are absolutely enchanting. The closest airport with international connections is Bari (there are frequent flights to Bari from Rome and Milan, and other major European cities). From Bari, you can either hire a car (at the airport) and drive to Matera (about an hour’s drive); take the Pugliairbus bus (direct from Bari Airport; about 1 hour 15 minutes); or take the bus or train from Bari Centrale station to Matera Centrale (about 1.5 hours). If you choose to hire a car, note that the Sassi is not car-friendly. Check with your hotel for parking options – some hotels have private parking, otherwise, you may have to leave your car at one of the parking garages along the outer ring road (Via Lucana; about €15/day) and continue on foot to your hotel. The train station is about a 15-minute walk to the Sassi. My advice is to pack light. Matera as seen from Sasso Caveoso. And if you choose to hire a car, spend some time exploring the regions of Basilicata and Puglia. One beautiful place to visit in Basilicata is the town of Castelmezzano. Should you be travelling from Bari to Matera, plan some time in the nearby Itria Valley in Puglia. This area, with its famous ‘trulli’ houses and whitewashed towns, is simply gorgeous! Check out my guide to the best places in Puglia. Matera is absolutely amazing! One of the highlights from my travels in 2017. Absolutely stunning! What an amazing place Matera looks like to be. Great captures. Thanks for sharing.